Before leaving Bolivia there were two places I just had to visit. La Paz because it's just a crazy location for a city (It's the highest capital city in the world) and Death Road, well because it's called Death Road! 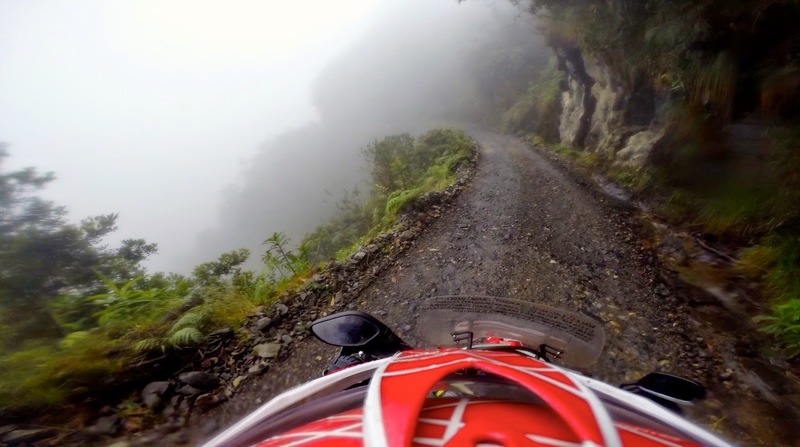 El Camino de la Muerte (Death Road) is named as such supposedly because of the number of deaths each year. However, I believe it is mainly to draw in thrill seeking tourists. It works. The road sees in excess of 25,000 cyclists each ear and the majority of the tourist vendors in La Paz offer a day trip to this infamous site. The road starts at around 4,700 meters, travelling down the mountain and through the jungle for about 30km. It is now bypassed and most tourists travel down it then take the bypass back to La Paz. I must admit to being a little nervous. I am not great with heights despite having travelled many dirt tracks with deathly drops in the Atlas Mountains and in the Himalayas. I work best when I don't know their coming! However, I could not let the experience pass me by and it looked to be a stunning trail with beautiful views. Mostly, it was a challenge! traffic and steep hills. After several minor incidents and 4 dog chases I was out and heading in to the snow capped mountains. It got colder as I climbed. The rain started and then the fog descended. I wished I'd put my thicker gloves on and I wished my heated grips worked (not for the first time). The mountains seemed to close in around me as I got closer to Death Road. Was it the weather and dramatic cliff faces or was it the name of my destination that made me feel I was riding to the gates of hell? I put it down to the weather and continued my soggy ride in. If only I had put my waterproof liners in! No longer sign posted by it's original name of North Yungus Road, the sign was clear - Death Road - Keep to the left! I looked down the track and saw nothing but swirling fog! It was dark and very uninviting. Who in their right mind would want to go down there? I felt like I was in a horror movie when the girl hears a noise in the basement and everyone is shouting at the screen "Don't go down there!!!" Of course she does. And so did I! I travelled down the first section quite easily. It is quite wide initially and then it starts to get narrower. "This is OK" I thought. I can do this. The track was smooth and although I knew it was there, the drop was masked by the fog. At the first passing place I found a group of bikers (the first of many) who were all being briefed on the next section in English. I stopped next to them and listened in. It seemed we could keep right (away from the drop) for the first bit but then we had to get back to the left. This was the hardest part for me. I didn't want to keep left! I wanted to keep as far away from the drop as possible. I plotted in my head to keep right anyway but as I was thinking this a loud horn came screaming through the fog. The road is still used by trucks to bring supplies to the villages that remain inhabited, and here came one now. Perfect timing to warn me to stick to the rules. What would I have done if I had been on the track at that moment though? There was no room to stick to the left or the right as far as I could tell! My nerves kicked in again and I let the push bikes go first! I would follow them slowly down and then at least I would have warning of any oncoming traffic. I think the army call it cannon fodder! There was no rush after all. In the end the road carried on down and the fog failed to lift. I got the hang of it and didn't face any further traffic although my pace was very slow (slower than the mountain bikers. I was actually losing them) and occasionally my brain screamed out "There's a big bloody drop there woman! What are you doing! Stop! Run away". As the road started to widen at about 15km I decided it was time to turn around and ride up it. I much prefer riding up and besides I was wet and cold and could see no stunning scenery. To continue the loop would have taken twice as long. It's not that steep but I always feel more in control when going up hill and so I allowed myself a little more speed, being careful to beep my horn on each corner to warn the many cyclists that I was coming. Of course going up I was also afforded the privilege of keeping against the cliff face! On the way home the snow came down and my wet clothes did not help the situation. I was freezing and in desperate need of a hot chocolate! Back in La Paz I warmed up with a hot shower, a hot chocolate and a large slice of cheesecake. It's important to treat yourself after facing your fears I feel! I felt a little cheated that I had not seen the stunning views I'd heard so much about but with no morale support to talk me through it, perhaps I would not have made it so far had it not been for the fog. I guess I will never know! but it's just awkward with a bike. There is generally nowhere to park and it seems not one of the 900,000 strong population have any road sense! The centre of La Paz starts at an elevation of around 3,600 meters and then works it's way up the surrounding mountains in all directions. At night, the view out of my hotel room was surreal. Instead of seeing a horizon all I could see was a wall of lights, like stars, climbing up another 1000 meters all around me. It was actually quite pretty. 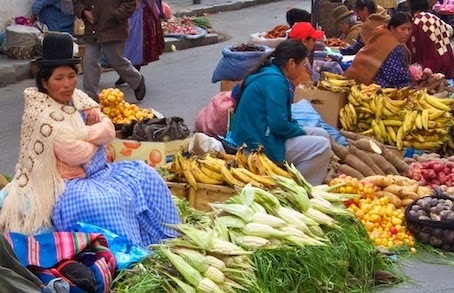 La Paz is also known for it's witches market where vendors trade their dried llama foetuses, potions and Coca leaves. 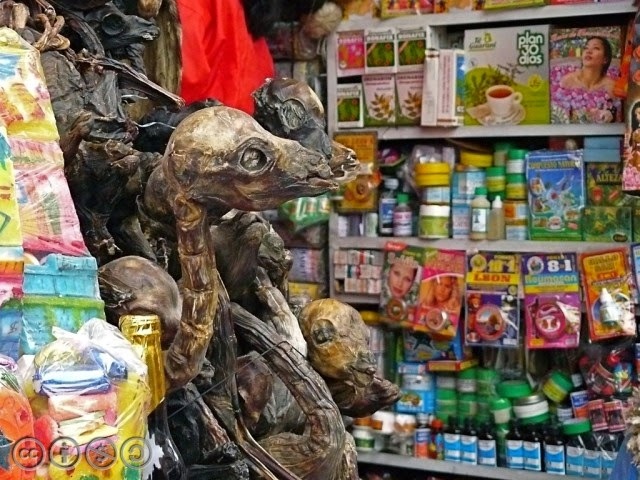 Originally run by witch doctors from the surrounding mountains, I felt it was just another tourist trap these days. We all have to make our money somehow though and if it floats your boat then it's still an interesting site. I did buy some coca leaves but after the first few fowl chews I decided I was better with a strong coffee for the altitude! Not a great taste. Coca leaves form the basic ingredients for Cocaine. However, there is very little of the drug itself in them and Coca Cola still use it as part of their ingredients in some countries today. Perfectly legal to buy and highly recommended to combat altitude sickness. The tea is great and I enjoyed it at my hostel most mornings with my breakfast. From La Paz I headed for the Peruvian border where a young man of about ten helped me through the process for the measly sum of about 50p. He watched my bike and pointed me in the direction of the correct queue to join at various intervals. He was very polite and helpful and I think he will go far! It took about 2 hours to get through in all and I managed to change my money from BOBs to Soles while I waited for the bike paperwork to be processed. I had decided to skip Copacabana as it promised to be another busy place and so my next destination was to be Puno, on the shores of Lake Titicaca. Hot chocolate and cheesecake sounds great, but don't forget 'clothes for all eventualities'. You are English, after all? Watch out for rougue cops south of PUNO. Make sure you have insurance and registratation.